Overall, being the general manager of the Los Angeles Lakers seems pretty sweet. Even apart from, like, getting to be a very rich person in a sunny and gorgeous town with great food and sweet beaches, it’s a good job: At any given time something like half the NBA’s best players seem like they’re either actively angling to get to L.A. or just passively extremely willing to go to L.A. All you have to do is clear some cap space and a uniquely low bar for organizational stability and competence, and the location and franchise pedigree will do the rest. LeBron James will come to you. That’s neat. Nothing under the sun could ever bring him to Milwaukee. On the other hand, a thing that seems to come with the job—particularly once you’ve used its advantages to score LeBron—is the expectation that the Lakers will pursue the championship with unique immediacy, not six years from now but now; there is no Process Trusting in Los Angeles. And that means that when you sign friggin’ JaVale McGee and friggin’ Rajon Rondo and friggin’ Lance Stephenson, in 2018, when none of them are, uh, good, you will have to stand in front of a room of reporters and explain that you did this to beat the best basketball team in history. “If you study championship and playoff teams of the past, if you look at Michael Jordan having a player like Dennis Rodman, look at Kobe [Bryant]’s teams with Metta [World Peace], having a tough player that brings an edge to the game like Lance [Stephenson] is a really nice ingredient,” Pelinka said. This part seems less neat, to me. 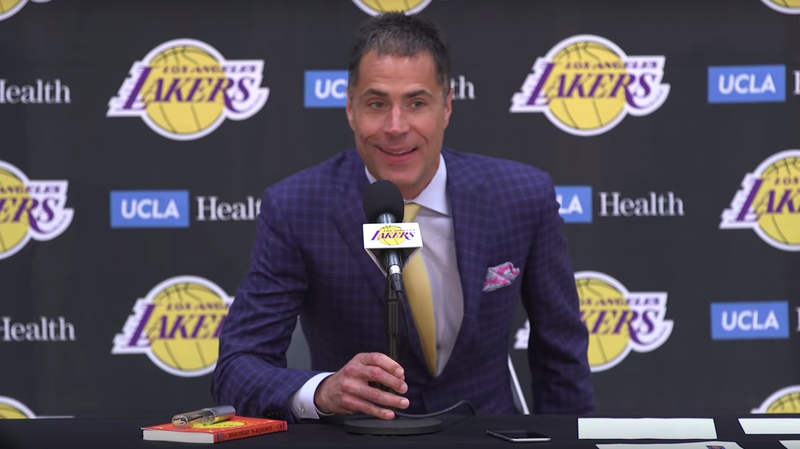 I can’t decide whether it’s a credit to current Lakers GM Rob Pelinka that when he says things like We signed Lance Stephenson because Michael Jordan won rings with Dennis Rodman on his team, and It’s okay that if you add together the jump-shooting range of everybody on our team it still doesn’t reach all the way to the three-point line, because we’ll beat the Golden State Warriors by mean-mugging and doing fast-breaks a lot, it seems like he might actually believe it. (For that matter, even if it is a credit to him, I’m not sure whether I’m crediting him with sincere optimism or acting ability.) In either case, I do not share those sentiments. In fact I am beginning to feel quite nervous about the 2018-19 Lakers. This isn’t the first time they’ve done something like this, you know. Back in 2014, the Lakers went into Kobe Bryant’s age-36 season with a trash roster featuring, in vital roles, such hilarious mutants as Carlos Boozer, Jordan Hill, Ronnie Price, and Wes Johnson. Being the Lakers—and particularly the late-Kobe Lakers, as invested in the Mamba mythology as in anything else at that point—they had to pretend this was intentional, the next iteration of Laker Greatness and not the green-glowing radioactive fallout left behind by the meltdown of the previous one, and so there was coach Byron Scott, insisting the team didn’t need things like “shooting” and “skill” and “not Carlos Boozer” because it would be winning with defense and toughness and, uh, turning down open three-pointers to attack the basket, for some reason. They sold it—or tried to—as a return to “Showtime” basketball, the runnin’-and-dunkin’ stuff the team rode to multiple championships in the 1980s (when it also at any given time had something like five or six of the NBA’s top 20 players on the roster). Then they won one of their first 10 games, and, uh, 20 of the 72 after that, and not the championship. Make no mistake: Starting with LeBron, still the NBA’s best player by miles at 33 years old, these Lakers are better in every imaginable way than that clown car of a squad. The possibility they’ll clean out the cupboards to pull off a Kawhi Leonard trade notwithstanding, they have a nice stock of promising youths: Lonzo Ball, Kyle Kuzma, Brandon Ingram, Josh Hart, and hell, even Ivica Zubac. Barring any two of LeBron’s limbs falling off, they seem like a safe bet to claim a playoff spot even in the absurdly stacked Western Conference, and LeBron would be a threat in the postseason even with any dozen randomly selected vagrants as his teammates. But, yeah, if only this week—if only for the duration of that press conference, and never thereafter—I am relieved not to be the general manager of the Los Angeles Lakers. I don’t think I could tell you, with a straight face, that Lance Stephenson is Dennis Rodman and therefore the 2018-19 Los Angeles Lakers have any kind of meaningful chance to defeat the Golden State Warriors. I think you’d be able to tell that I was joking. LeBronWatch: My SUPER CREDIBLE SOURCES Say He’s Going To L.A.